Adam Rosenberg: Yeah! Patented being the key word! First, as a quick snapshot, all of the materials, we have over 30 patents on materials and processes at Edward Mirell and Spectore Corporation which is our parent company. 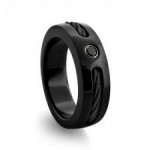 Black Titanium is definitely one of our most popular, we actually came across it by accident. We were making a bracelet for Eddie Van Halen, and he wanted a design carved with a gold inlay into the bracelet, so when we were creating the material we had to soften the metal up because Titanium is so naturally hard. So we used an alloy, and then we’re trying to naturally melt the gold into the channel of the bracelet for the design that we made. We placed the bracelet in the oven and through the heating, the material turned black. What actually happened, we thought, maybe we burnt the metal, but we actually made a molecular transformation, not to get too “science” here, but we changed the metal, we turned in black from outside in, creating this phenomenal ceramic hard surface. The problem with ceramics typically is that they are so hard that they’re brittle, and that they can crack under certain pressure. Black Titanium still has that metal ductility in the centre, meaning that it has give, so if you were to drop it or hit it or anything like that, it cant break. But it has that absolute beautiful hardness, its got a brilliant shine to it, and it is absolutely one of our number one, it is our number one selling material right now. All of the metals that we work with here at Edward Mirell are all medical grade, from our grey Titanium to our Cobalt to Black Titanium. We certify all our pieces within our collection with a certificate of authenticity, that really speaks of that quality level. That’s something that you’re just not going to find in any other brand or any other product that doesn’t come from our manufacturing facility here in the USA. NF: And when we talk about Black Titanium how does that differ from the Black Titanium, or what is marketed as Black Titanium out in the marketplace that is NOT Edward Mirell. AR: Excellent question and this is definitely one of those buyer beware moments. Typically, well what they ARE doing, is that Titanium is the base metal for that piece of jewellery. But what creates that black is a PVD process. PVD stands for Powder Vapour Disposition, and its basically the same thing that they do with lawn furniture. So it’s a coating that’s on the surface of the metal that makes it black, and that can chip or scratch or basically flake away, so the metal itself is not black. We do own the patent on that process and that material. So that’s the only place that you’re going to see that is from our facility in Florida. NF: One of the keys being there that if you scratch the powder coated “Black Titanium”, it will scratch a grey colour underneath, whereas the Edward Mirell one wont. AR: Correct, yes. The Black Titanium in the Edward Mirell line is a ceramic hard surface, it’s the metal itself, its not a coating, so it can’t chip away. The inside actually is somewhat grey in the centre of it – that’s what gives it the ductility, but it creates an oxide on the outside of the surface and it creates that ceramic hard surface. NF: And I believe there’s some fairly large multinational companies that are interested in your Black Titanium product? 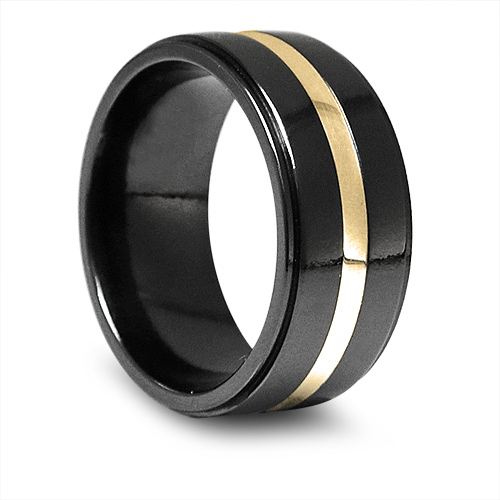 AR: There are, again that’s where pieces coming from our facility are the true Black Titanium, so there are some world class brands that really understand the importance and the growth of a contemporary metal jewellery category. And they want it done right and with the highest quality, and with the best material, with our patented processes, so there are some world class brands that you’ll see that do have Black Titanium. 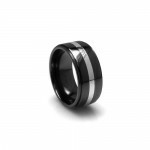 But so far as your standard jewellery brands that you may see shopping on the internet that tote themselves as Black Titanium, that’s where you really do need to be careful because we do own the only natural black metal in the market.